Figure 174: What Is a Plasma? In addition to the three familiar states of matter—solid, liquid, and gas—there is plasma, which constitutes at least 99.9% of the matter in the visible universe. Plasma is like a hot gas, but contains a nearly equal number of free positive and negative electrical charges. It is the material of stars and thinly permeates our solar system, our galaxy, and the universe. Visible examples of plasma on earth include the glowing material inside a neon sign, a welder’s arc, and a lightning bolt. Fortunately, the earth has little plasma. 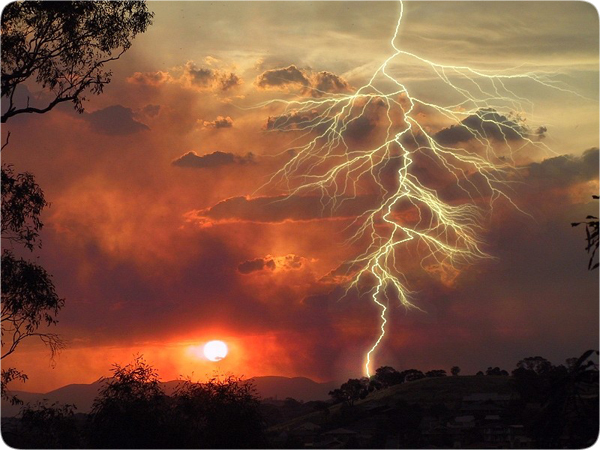 During a thunderstorm, clouds build up electrical charges which differ from those in the solid earth below. If that electrical difference (or voltage) becomes large enough, air along one or more paths breaks down into flowing electrons and positive charges—atoms and molecules that have lost electrons. They collide with and heat other air molecules, stripping away more electrons and leaving behind an extremely thin trail of flowing electrical charges. Near each branch of the lightning bolt, intensely heated air expands so fast that it makes a loud crack, whose rumbling echoes are thunder. Electrical breakdown can also occur in solids and liquids. Breakdown begins when a powerful voltage removes an electron from a neutral atom, giving the atom a positive charge. This positive charge and freed electron, flowing as a plasma, accelerate in opposite directions, collide with other atoms, knock out more electrons, and, yes, occasionally produce new chemical elements!1 So much heat is generated from collisions that even more atoms lose electrons. A plasma flow is like an avalanche of snow; once it begins, it continues as long as there are flowing electrical charges (loose snow) and the voltage (steep mountain) remains high enough. Within the fluttering granite crust at the beginning of the flood, the piezoelectric effect (which will be explained later) generated high enough voltages to initiate plasma flows—electrical breakdowns—within the crust. 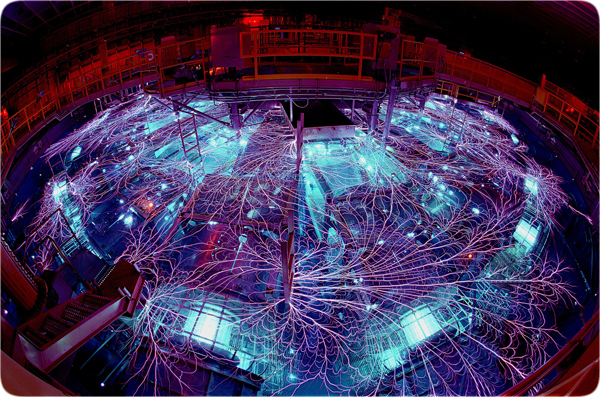 Figure 175: Arcs and Sparks at the Sandia National Laboratory. Electrical charges flowing within plasma act as if they are flowing in trillions of nearly parallel, closely packed wires. Each moving charge creates a magnetic field that cuts across nearby “wires,” producing a force that steadily squeezes charges toward each other. (This same force drives electric motors.) A high burst of current2 through parallel wires produces a powerful force, called the Z-pinch, which pinches the wires together. In the Z-pinch machine above, the electrical surge vaporizes the wires and creates a plasma. The Z-pinch then tends to fuse atomic nuclei together. Nuclear engineers at Sandia are using this extremely powerful compressive force in plasmas to try to make a fusion reactor. If this or other technologies succeed, the world will have inexhaustible amounts of cheap, clean electrical energy.3 This chapter will show that gigantic electrical discharges within the earth’s crust during the global flood quickly produced earth’s radioactivity and—based on today’s extremely slow decay rates—billions of years’ worth of radioactive decay products.